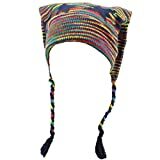 Rainbow mix with black stars slouchy beanie hat with 2 braided tassels. The Hat is a unique and creative product. It is made in best quality and will bring you joy for a long time. No Risk, much fun!! We have a 100% Money back Guaranty if you are not satisfied. High Quality Hat (see Picture). The Hat is embroidered on high quality Twill fabric. We only use best quality material. The Hat is produced with a high qualitiy material. It`s 100% washing resistant up to 60° degrees Celsius. Get here a very creative and unique hat.